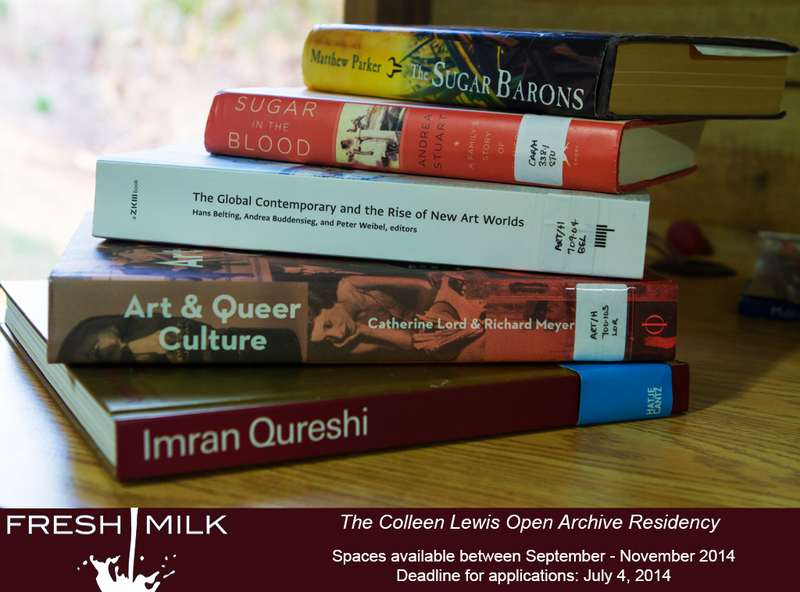 FRESH MILK is pleased to announce the Colleen Lewis Open Archive Residency between September and November 2014. Applications from artists worldwide are welcomed. This residency aims to support visual artists, writers and creatives by offering a peaceful working space for a minimum of 4 weeks, and the opportunity to interface with the Colleen Lewis Reading Room (CLRR) as an archive with which to engage, respond and activate. For more on the archive, view our online bibliography. The CLRR is continually expanding its collection and has a special focus on the visual arts, with particular interest in archiving material on visual arts in the Caribbean. Resident artists will also be able to meet with the Fresh Milk Books team of young creatives on a weekly basis to converse and collaborate. Spaces are available between September 1st and November 28th, 2014. For more information on the residency and associated costs please visit our International Residency Opportunity page. Artists wishing to apply for residencies with projects outside of this targeted call are also welcome to submit proposals. The deadline for applications is July 4th, 2014.